On our way down to Philly! 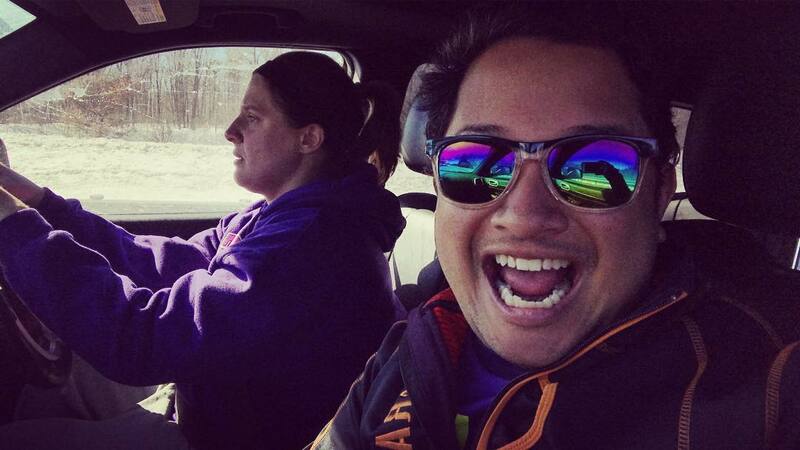 Minutes after finishing the Two Rivers Marathon in Lackawaxen, Pennsylvania, Danielle and I took off for the three hour drive down to Philadelphia. We were in the northern Poconos with virtually no cell reception, so after getting gas and proceeding to the main road, we finally got to the highway, where we were able to conjure the GPS gods to give us some semblance of service to guide us along the quickest route south. The late start to the Two Rivers Marathon at 9am, and my 5 1/2 hour finish had us leaving near 3pm, which would get us down to Philly just in time for the start of our friend Steve's 100th half marathon celebration dinner at an Italian restaurant in University City at 6. 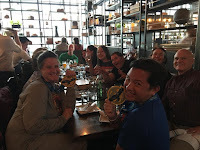 We arrived and stretched out our tired legs as we walked from the parking garage to the restaurant, treated to the lovely greetings from the many friends who were in town to participate in the weekend's festivities. Our friends saved us a seat at the big table, and we enjoyed a friendly dinner in the company of friends old and new, some who we hadn't seen in quite some time. After dinner, Danielle and I with our friend Kimberly retired to the Courtyard Marriott I booked using my one free night I had acquired in 2017. 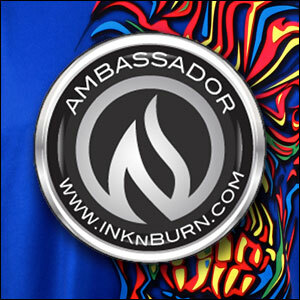 Kimberly had arrived earlier that day in Philly and kindly picked up our bibs for us at the expo. We all crashed hard that night, especially Danielle and I after a long day of running and travel - I struggled to stay awake while the Michigan-Florida State Elite Eight game unfolded on TV, and managed to see my alma mater take the win to earn their spot in the 2018 Final Four (!!!) that night before conking out. The temperatures dropped considerably overnight, and we woke up the next morning to frigid temperatures, much colder than what we had experienced in Lackawaxen. Wearing several layers, we left the hotel in a pricey Uber (damn you, surge pricing), bringing us to the museum area dangerously close to my call time for the national anthem. 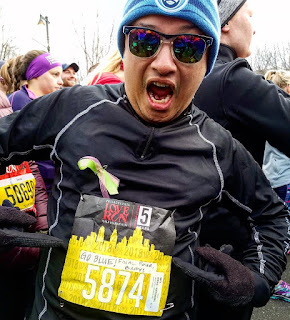 Not only that, police had blocked off part of the road, so we were left to exit the Uber while we were on the offramp from the highway, to then gingerly jog to the start area. 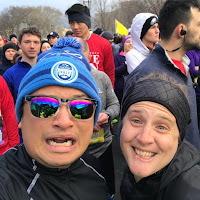 Danielle accompanied me as we made our way down toward the Eakins Oval, slowly and painfully (haha) as we warmed up muscles already sore from yesterday's race. 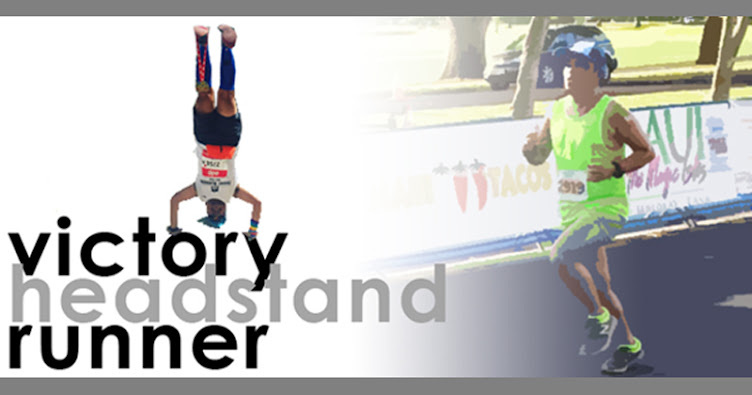 There were LOTS of people there, and after weaving through throngs of runners preparing for the start, I made it up to the startline booth, where I introduced myself to the announcer. The race was starting at 7:30, and they had me sing about ten minutes before. Within seconds of starting the anthem, I realized just how good the sound system was, set up all along the Ben Franklin Parkway - so I slowed down my tempo, and allowed my voice to echo across the canyon like street, as the acoustics bounced off of the face of the Philadelphia Museum of Art and the iconic "Rocky Steps" all along the length of the massive boulevard. After I finished, Danielle and I rushed back into the corrals to get into a proper area where we wouldn't impede any other runners since we were going to do a bit of running and walking. 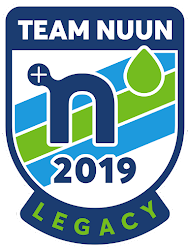 There was a bit of delay before the start, and since we moved a little further back in the corrals, we didn't cross the startline until roughly 7:55. 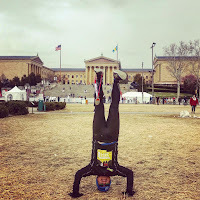 The course took us straight down the Ben Franklin Parkway, past Logan Square. With Danielle and I both feeling very sore, we decided to do a bit of fartlekking, using the country flags along the parkway as landmarks to run to before walking, and vice versa. Along the way, we saw several friends including Jennifer, Lilian, and Tawanna, all present at the dinner the night before. 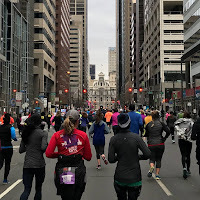 When we got to the grid of the downtown area (turning right onto 16th Street, then right again onto JFK Boulevard, then going four blocks before turning left onto 20th Street, then a long stretch along Market Street that curved around Philadelphia City Hall), we decided to alternate between running and walking as we passed stoplights. 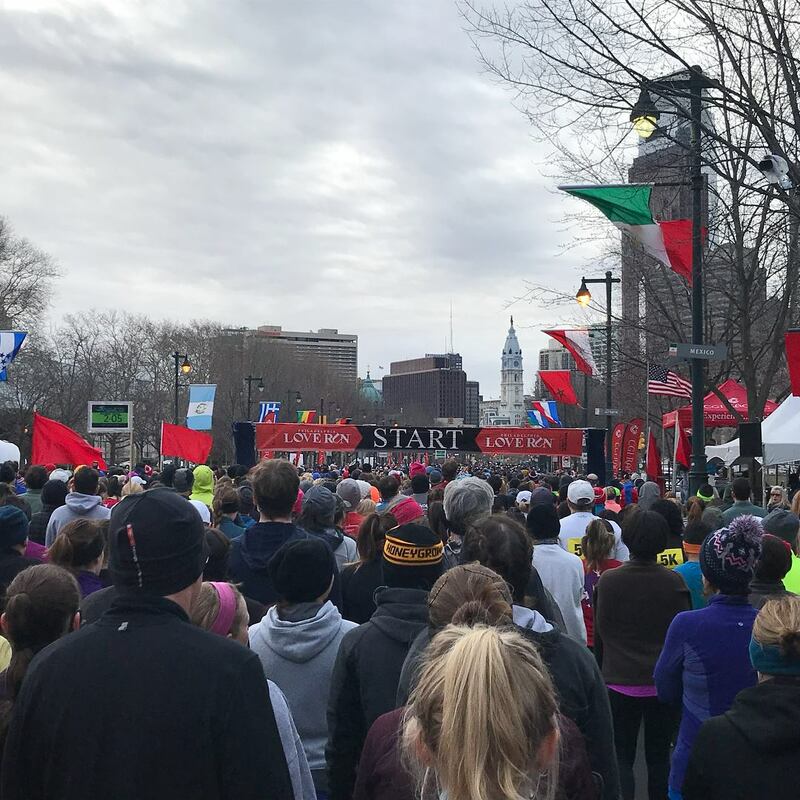 5K runners, who had been running with us since the start, veered off to continue around City Hall back toward the start, while we continued on, finally turning at 6th Street. 6th Street affronts Independence National Historical Park, a 20 block section of eastern Philadelphia with museums including Independence Hall and the Liberty Bell. 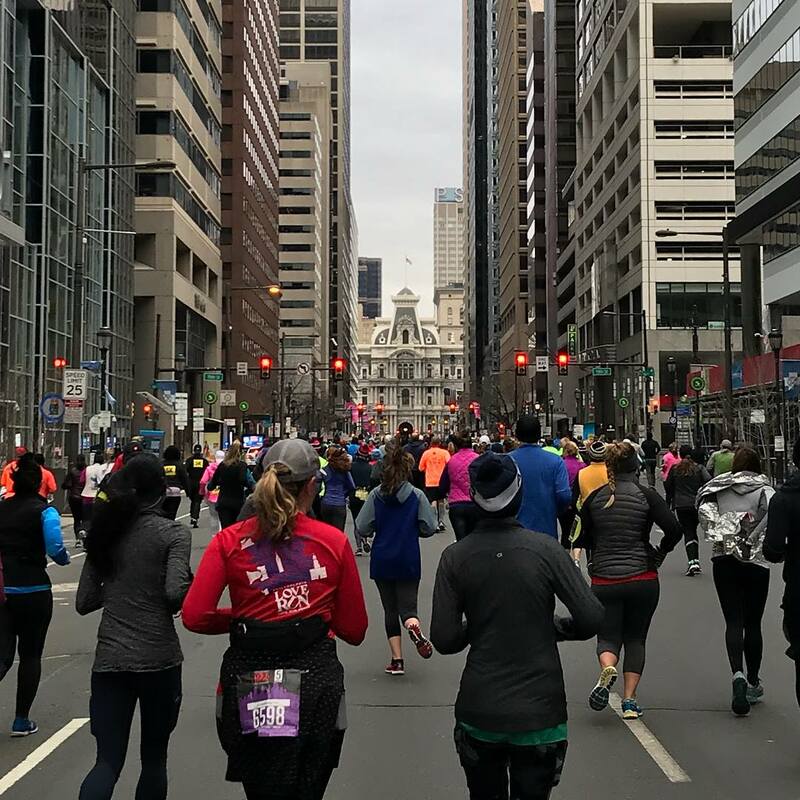 We only ran the single block in front of the Independence Vistors' Center before turning left once again onto Arch Street, where we ran back toward Ben Franklin Parkway. Danielle and I continued our run/walk game with the stoplights, as we hit the three mile mark. At one point, I asked her if she had seen Steve and his wife Pam, and just as I mentioned that, there they were running right next to us. Kismet, I tell you! 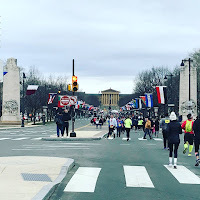 Eventually we were back on the Ben Franklin Parkway, and it was a long way back toward the Art Museum. We reunited with the 5K runners as we approached closer and closer, getting past the startline which was being taken apart, eventually hitting the four mile mark. 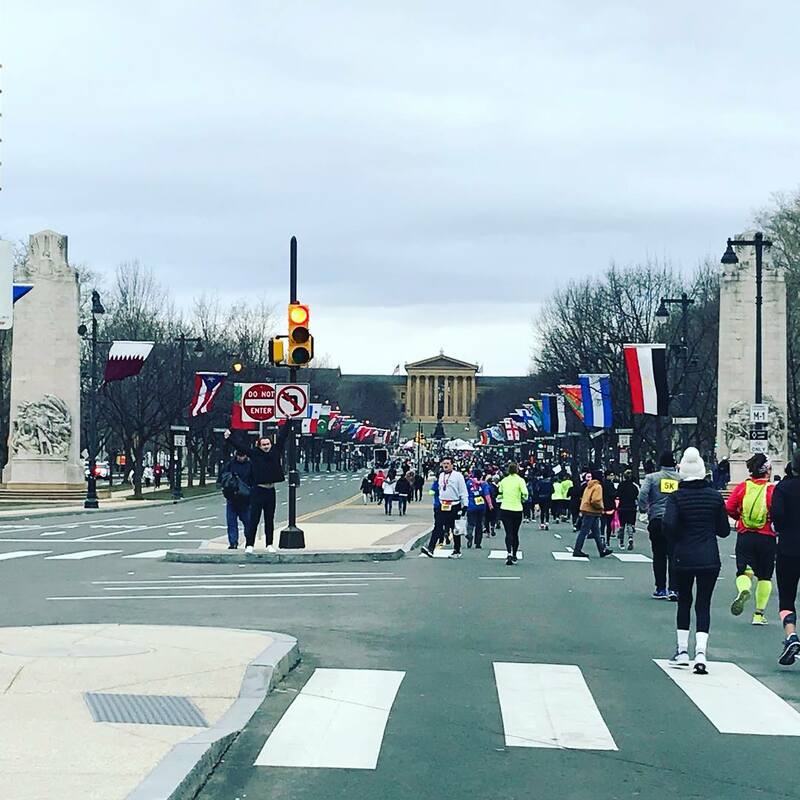 The course curved us around Eakins Oval, and as the 5K runners were directed toward the finish line in front of the Art Museum, the half marathoners were led to continue on along Martin Luther King Jr. Drive. Just before the 5K finish, Donna was there waiting to cheer on the half marathoners as they went past. Our course led us downhill along a ramp that took us over the Schuylkill River to its western bank, as we ran along MLK Drive which hugged the US-76 Schuylkill Expressway to our left. 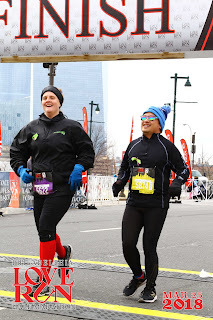 Danielle and I took our time, as we ran along the road, again using landmarks to either begin or end our run segments. Several of the fastest runners were coming up along the other side of the road as the remainder of the race was essentially a long out-and-back deep into Fairmont Park. Among the spectators at this point of the race were a few folks dressed as Easter Bunnies on the other side of the road. 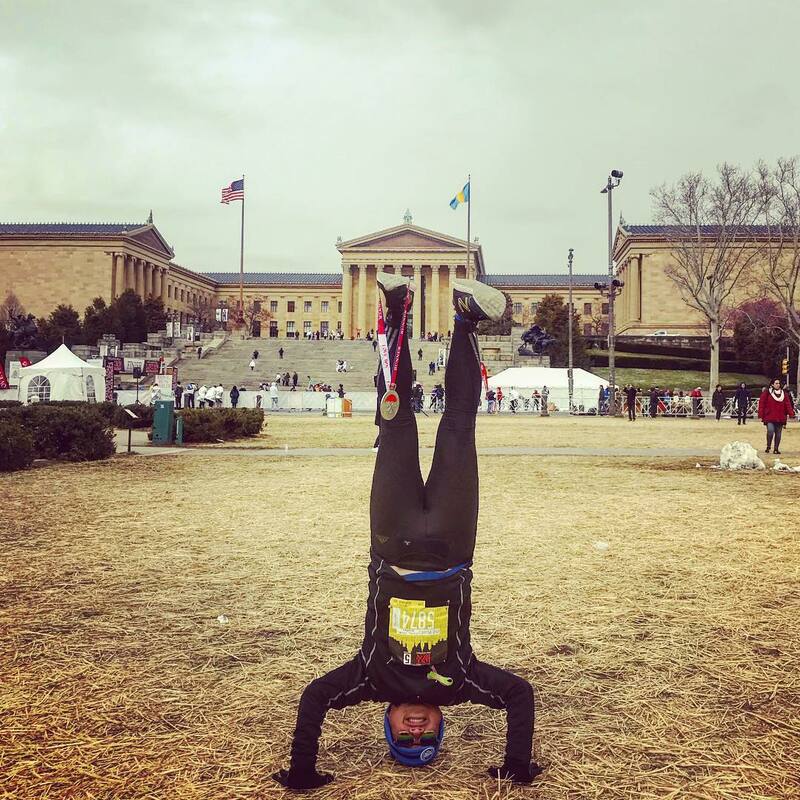 We ran past the Girard Bridge and the stone arches of the Connecting Railway Bridge for the Pennsylvania Railroad, and while running alongside the Schuylkill Expressway, would use the poles for the overhead highway signage as our fartlek landmarks. 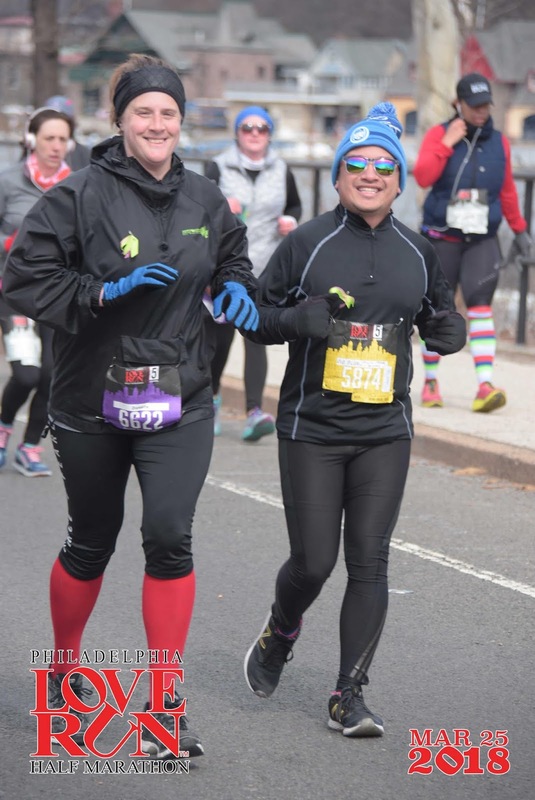 Just after the 7 mile mark, as Danielle and I were completing a run segment of the race, up ahead we noticed Pam and Steve walking with a couple of their friends, and them veering to the left to an ambulance parked next to the race route along Montgomery Drive. Pam had tripped moments earlier on the asphalt, putting a gash into her knee and bloodying up her knuckles in an attempt to not to faceplant onto the hard ground. 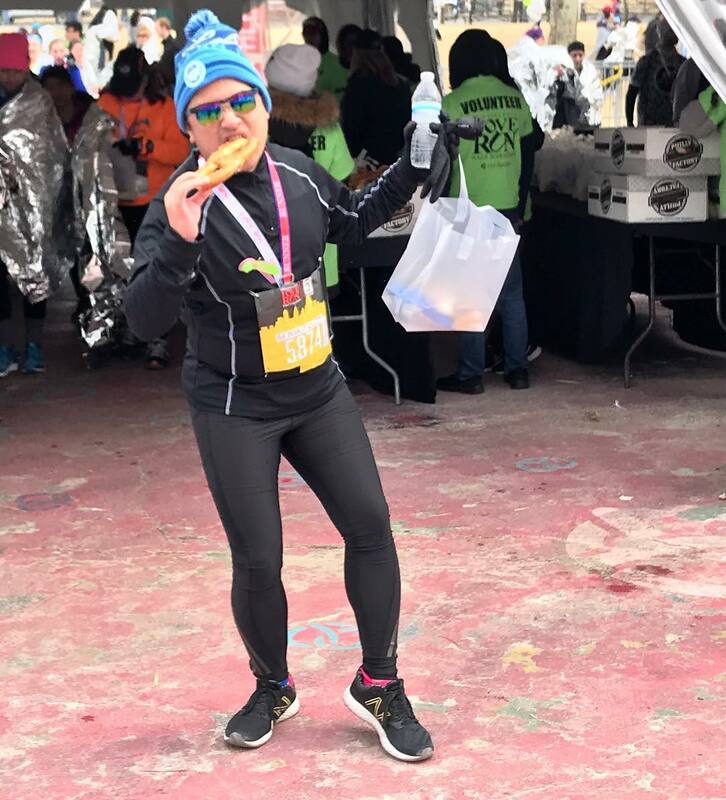 Luckily, the ambulance was there to render her first aid (but strangely, without essential medical items such as rubbing alcohol), and powerful Pam as she is, realized she was still capable of running and continued on along the course. Danielle and I followed suit under the Columbia Bridge, but they just kept powering on, and we held ourselves back, continuing our walk/run pace using landmarks. 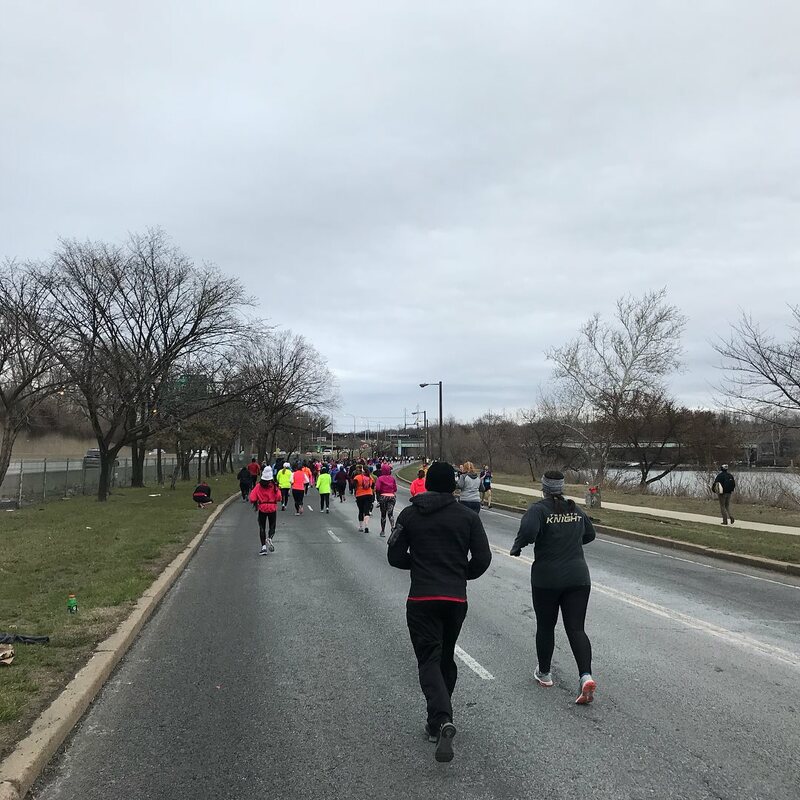 We caught up to the group as we ascended the first real hill of the race, a ramp leading up to the Strawberry Mansion Bridge, a steel arch truss that spans across the Schuylkill River. We crossed the bridge, gingerly keeping our knees in check by walking most of its length (concrete isn't so fun), then headed up another small hill along Woodford Drive taking us to the driveway up to the Historic Strawberry Mansion, a summer home located in East Fairmount Park. It got its name from farmers who would rent the mansion back in the mid 1800s, who would serve strawberries and cream to the public. 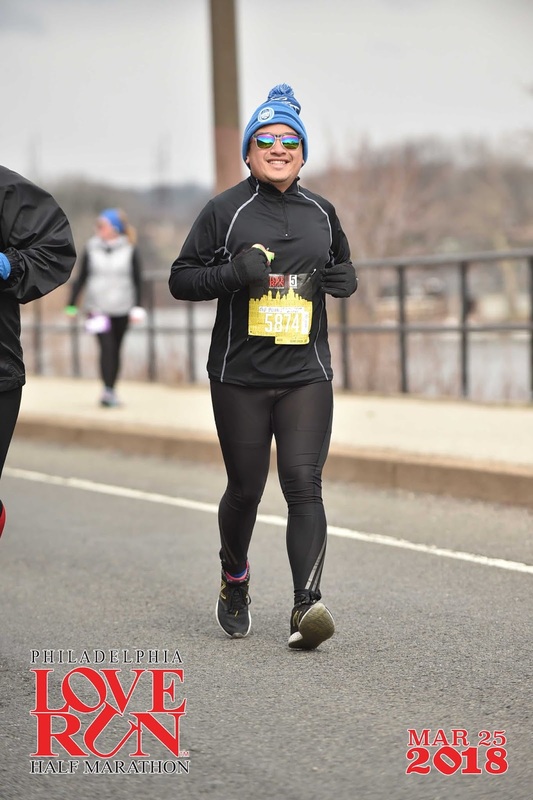 The route then took us back down to the Schuylkill along the other side of the hill, as we took advantage of gravity, descending back along Strawberry Mansion Bridge Drive to run across the bridge one more time. We then took another ramp as we proceeded northward to a turnaround point, not quite in view from the bridge, but roughly a half mile further up MLK Drive, before we turned right back around. 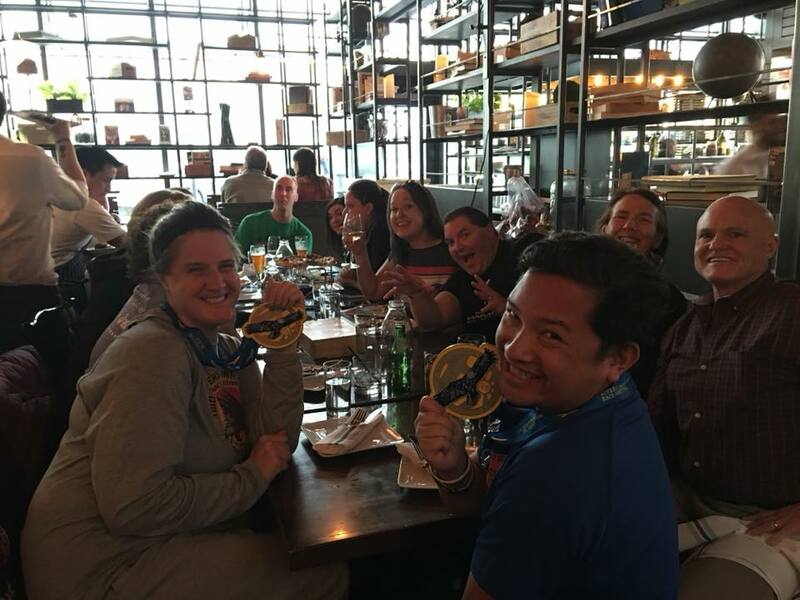 Along the way, Steve, Pam, and their small group continued to power away and passed me and Danielle, who were already aching for the finish, despite still having another three miles to go. 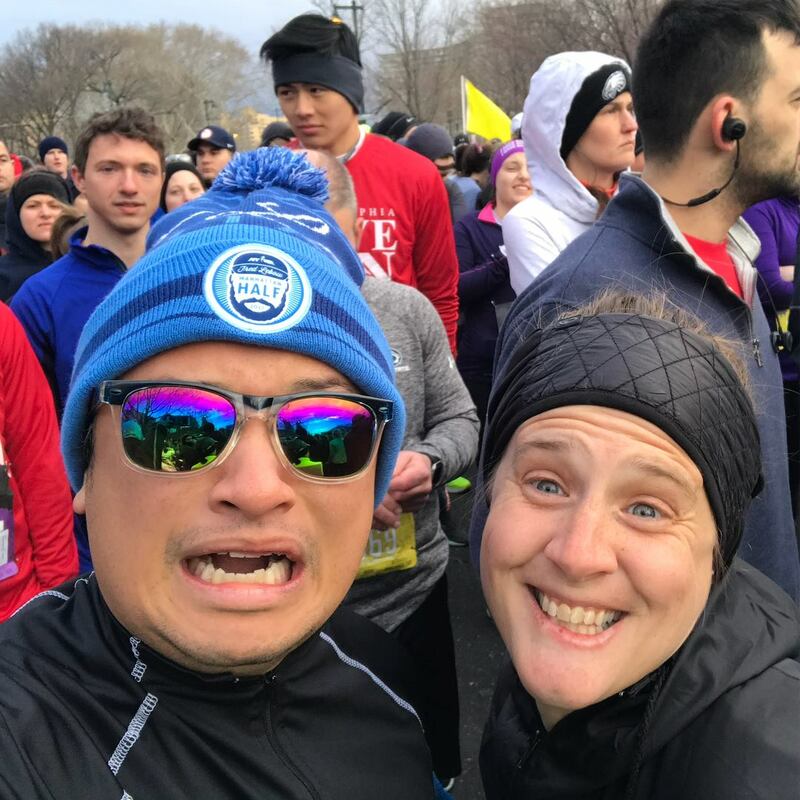 Miles 11 and 12 were pretty painful, and the cold and wind were wreaking havoc on us, as we continued our run/walk method all the way back toward the Art Museum. We were so cold, and wanted to be done, but our muscles were forcing us to take our walk breaks as we needed them. We reached the point where we saw the Easter Bunnies earlier, who were still there, cheering us on in the demonically cold weather. They were apparently giving out little plastic Easter eggs with candy in them - but seemingly rather selectively, and they frustratingly skipped us as we passed them. I was so hungry, haha! Soon, the three hour mark ticked by, slow for the both of us - but we powered on through, over the road that drove across the Schuylkill River and across the ramp leading up to the Eakins Oval. A pretty steep ramp lay ahead but at the top of the ramp was the last hundred feet to the finish line. Danielle and I crossed in 3:13:22, both relieved to be done after a tiring two days of races. 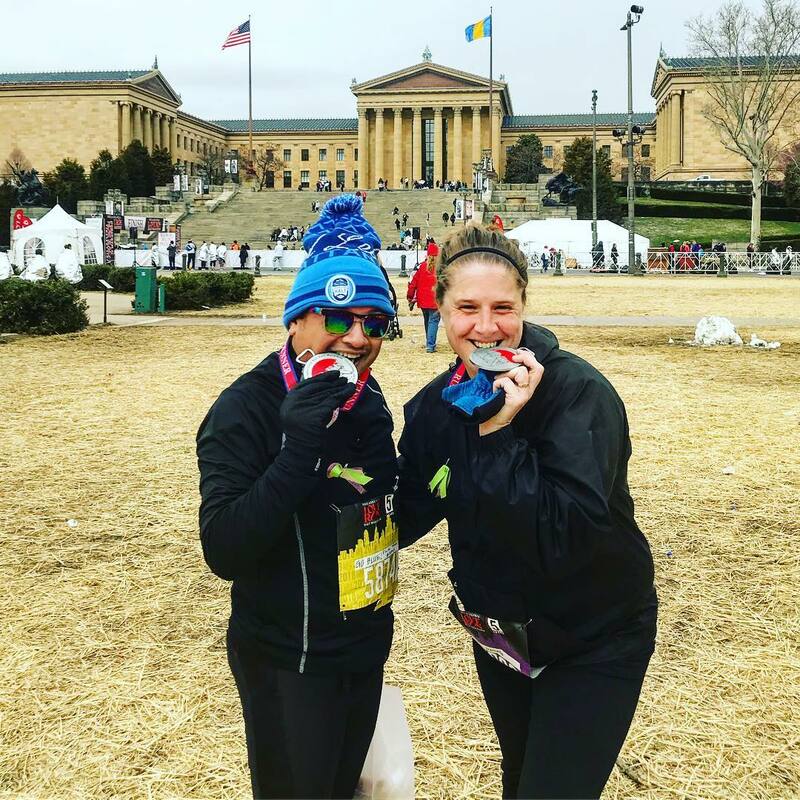 We found our friends after the finish chute as the winds continued to blow down Ben Franklin Parkway, obviously having become a bit of a headwind toward the end of the race. 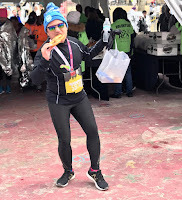 After getting pretzel bread through the finisher chutes (something I look forward to after every Philly race), we got an Uber back to the hotel to shower, change, and pack, before checking out and heading to lunch and drinks for a celebratory afternoon at McGillin's Olde Ale House. Instead of taking my later bus home to New York, I got a ride back with Lynn and Donna, who had driven in on Saturday; upon returning to NYC, I was dropped off at a bar in midtown, where I was attending my friend Winnie's going away party! It was a jampacked weekend, but one with a ton of fun, finishing 39.3 miles over the course of two days, and checking off Pennsylvania as a marathon state in the process!